If you are not sure where to start, Sinopia can help with this Introductory Pigment Set. 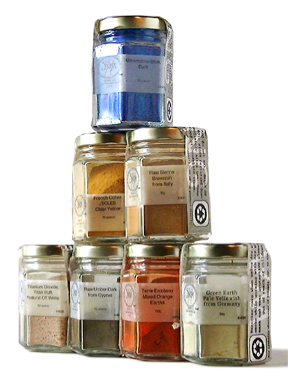 This kit includes 8 pigments in 50g jars. Use these pigments with any binder such as oil, acrylic, casein, gum arabic for watercolor, or even fresco lime for fresco painting. Choose the sturdy palette knife as a mixing blade. Please note that the colors in the pigment kit change from time to time to reflect the most popular colors. Currently the set includes: Titanium Buff, a Yellow Ochre, a Raw Sienna, a Burnt Sienna, a Sinopia Red Earth, a Raw Umber, Burnt Umber, and a lime proof Ultramarine Blue. Q: Can these pigments be used to tint the casein chalk silverpoint ground? If so, are they mixed into the ground in their powdered form? A: These pigments can be added to the Silverpoint Chalk Ground, but in small amounts. It would be best to predisperse the pigments in water, before adding them to the ground. For better results, try the Casein Base, which comes in deep and light tint version. They utilize the same Casein Binder as the Ground, but they are more suited for tinting.